Cocktails | Gourmet from the galley! First off this is not a beer. This is a ‘Brass Monkey’ cocktail which I shook the bejesus out of until, when poured, it had a frothy beer-like head and an amber hue, hence Brass Monkey Beer. Delicious. I made this cocktail when we were anchored near “James Bond Island”, exploring the beautiful karsts and hongs in Phang Nga Bay, Thailand…. I know it should have been a martini, but heck there’s always time for that later. Divide six ice cubes between two scotch glasses. 3. Shake it vigorously for minute and pour into the two scotch glasses. The result should be amber in colour and have a frothy head… Brass Monkey Beer! If life gives you limes, make margaritas. Freshly squeezed lime juice is the key ingredient to a good margarita. Nothing beats the taste of the fresh lime, and here in the tropics I have easy access to limes most of the time. Hence a lot of the cocktails I make for sundowners have the zesty, fresh flavour of lime in them. It’s a great source of vitamin c, and does therefore keep the scurvy at bay…. well that’s what I tell myself anyway! I dip the rim of my serving glasses into a little lime juice and then dip it into salt. I add some roughly crushed ice cubes to my prepared glasses. In a cocktail shaker, I shake the first three ingredients with a couple of ice cubes until well shaken. I then pour the delicious concoction into my prepared glass. Now all I need to complete the picture is my hammock, the shade of a couple of coconut trees and a good book to read. Ahh paradise! Holy Cow! This was delicious! Our mangoes were getting a little over ripe so I chopped them up and put them in the freezer. I forgot about the mango for a few days, and then low and behold what did I stumble across just when we had decided it was cocktail time? You got it in one… the frozen mango. MANGO DAIQUIRI SLUSHY TIME! Throw it all in the blender and blend until prefect slushy slushiness. Fill a couple of glasses with the concoction and viola… yummy, yummy adult slushy! Enjoy! I made this delicious cocktail when I wanted to use up the left over juice in our fridge. We were anchored in Telaga, Langkawi and were preparing to leave for Thailand the next day. We were getting the chores done and it was hot. This refreshing cocktail was just perfect at the end of the day. For two cocktails I mixed 1 cup of Guava juice with 1/2cup of apple juice, 2 tablespoons of fresh squeezed lime juice and 3 shots of vodka. I poured it over ice cubes and lime slices and topped with soda water. This Pina Colada was the celebratory drink that I made on our first afternoon in Thailand waters. We had arrived at a little island called Koh Chuku and the water was crystal clear. As soon as we dropped anchor we jumped into the water for a snorkel. It was beautiful, clear and full of fish. Heaps of them; big fish, small fish, barracudas, parrot fish, wrasse, you name it we saw it… we even swam through schools of tiny bait fish. Then we got to work scrubbing the bottom of the boat. After our swim and our scrubbing this Pina Colada was just perfect! Poured into two tall glasses, garnished with pineapple and a lime slice and viola…. yummy! Dwayne made this Bloody Mary while staying at Nongsa Point Marina, Batam (Indonesia) when we had Gary and Libby (SV Aquarius) aboard for drinks. Libby and I were real pirates and drank rum while the ‘girls’ I mean the skippers had Bloody Marys. 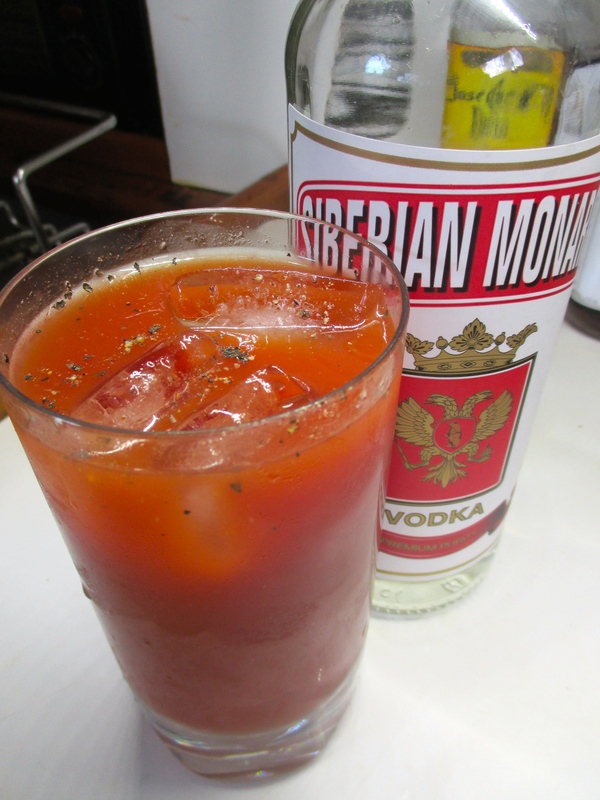 I have since asked Dwayne how he made his Bloody Mary and this is it…. To a glass he added ice cubes and then poured over vodka and tomato juice. Added a dash of Tobasco sauce and some freshly ground black pepper. Voila! Easy Peasy and tasty so they say.